My mother rarely talked about my father, SGT. EDDIE E CHERVONY. I was dressed in ALL WHITE. In the 60's many still wore black to funerals, being that I was only 13 months old they didn't want me to be traumatized. I don't know if this was her idea or if it was suggested to her. When my mother died May 9, 1997, I asked my Aunt Rachel, she was married to my dad's older brother, Herman, if she knew of anyone who may have had taken photographs of my dad's funeral. She shared with me that she thought that Uncle Herman may have taken some photographs. On Memorial Day 1997, I visited with her and she gave me 6 photographs of the funeral. This was the first time I had taken any photographs of my dad's memorial service/funeral. "a toddler girl, with light brown hair, in a white dress". I'm about 99% sure that it is me. At this time, this is the only picture that I have of us together, in my possession. 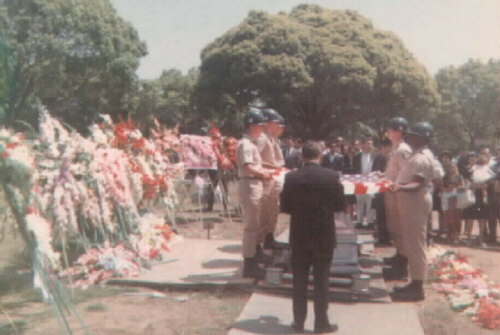 "CLASS A" uniforms, however, in May 1968, we lost 2,370 soldiers due to the War. Therefore, I can hardly begin to imagine the high demand for MILITARY PALLBEARERS. As you can tell , there were many recent graves in the immediate area. Thank you to the pallbearers who escorted my dad's body, they were from Fort MacArthur. 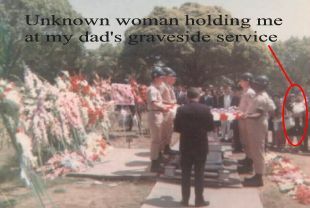 My dad is buried at the Los Angeles National Cemetery on May 24, 1968. My mother was buried with him on May 14, 1997.